We’ll start with a reminder that the letters Jack sent home from his First World War service can be seen 100 years after the event at www.jackwelchdiaries.wordpress.com . But here we have Jack (He was actually James) in much later life sitting at his desk and working at some kind of ledger. We don’t have a year for this photo but the location was a room the family called ‘The Blue Room’ at Beech House on White Street. There we see Jack’s hands and a rather lovely fountain pen. The pen would be a museum item now – indeed we have a similar if less ornate one (click here). Sadly, we can’t quite make out what Jack was working at. Some of you may be following the Jack Welch Diaries – our museum blog about Jack’s service in World War One, 100 years after the event and written in Jack’s own words, either in his diary or in the more substantial letters home. Jack was born and raised in Market Lavington and after the war he settled here again and raised his own children, Peggy and Tony in the village. Peggy later married Tom Gye and is well known as the founder of our museum. We owe a huge debt to Peggy and so do you, the reader. Without her there would be no museum and no museum blog. Peggy herself was never a computer user but we reckon she’d be thrilled to know that her work now reaches a worldwide audience. We know that in the last thirty days people in 57 different countries of the world have accessed this blog. Yes, Peggy would be delighted with that. 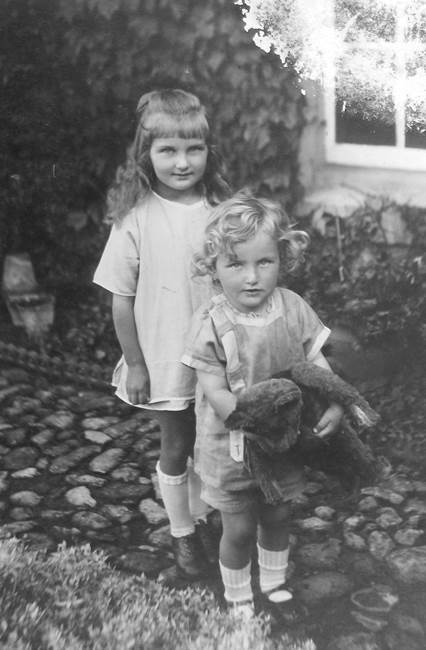 And we were delighted when we were given another photo of Peggy recently, this time with her little brother, Tony. The photo has a bit of damage, but the important areas are fine. We estimate this photo as dating from about 1925/26 and we are fairly confident the location is the garden at Spring Villa. The owners of the original actually had not recognised the people and had no particular connection with the Welch family. They did not know why they had this particular photo. We are always pleased to see photos of our founder, albeit this is 60 years before the museum opened its doors. She was born in Brighton in Sussex in about 1892. Her father, Henry, was a house painter. In 1911 she was a servant in Brighton. In 1912, on holiday in Weymouth, she met Jack Welch and a relationship developed. The Great War intervened, taking Jack away for more than three years and he returned injured. The couple were not able to marry until 1920. They set up home in Market Lavington where they had two children. 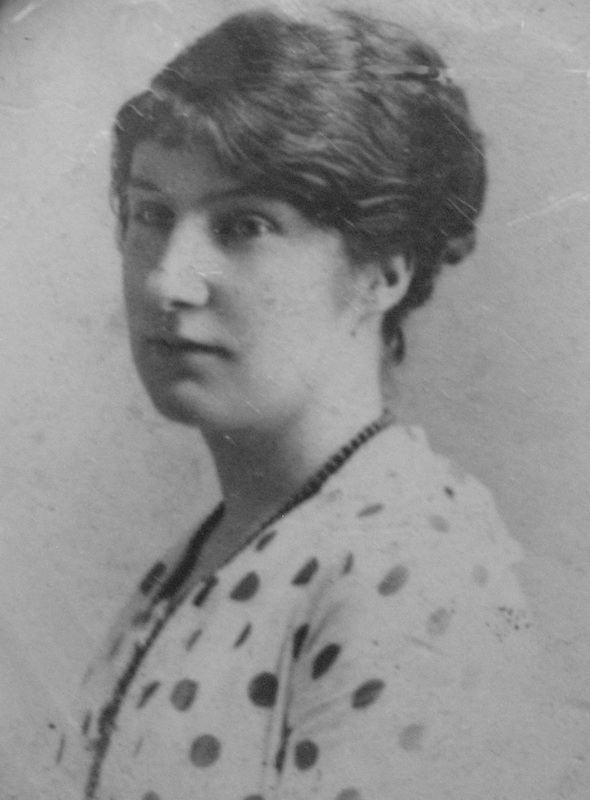 Marjory was born in 1921. She was known as Peggy. Tony followed in 1924. The family lived at two different cottages – Meadow Cottage and then Spring Villa. Sadly, Floss’s life was to be too short. She died in 1933, aged 40 and was buried in St Mary’s, Market Lavington. It doesn’t seem possible that it is now more than four years since our museum founder and, for many years the curator, died. But it was back in 2010 that Peggy left us. We, at the museum, do not forget her or the legacy she has left for all Lavington lovers to enjoy. But let’s for a moment enjoy seeing Peggy again – albeit as a little girl. This was at a time that very few people in the village will now remember for it was 90 years ago. 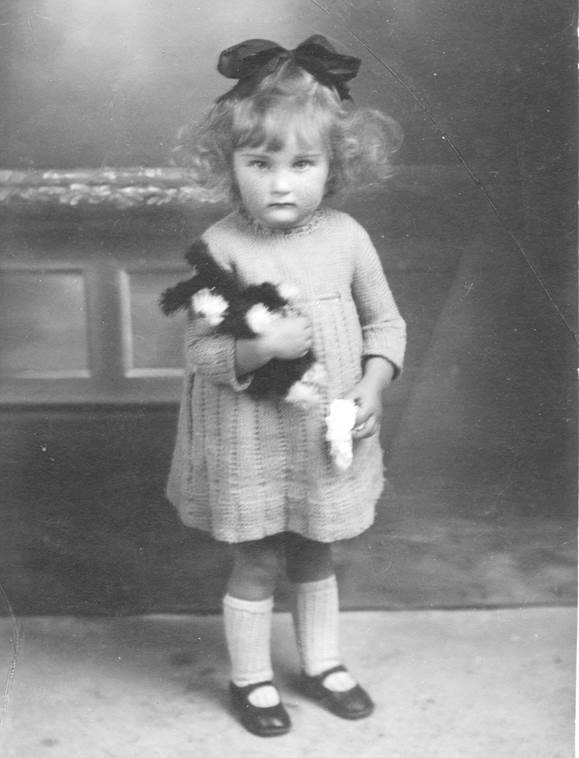 Yes, this was Peggy in 1924 wearing her sensible shoes, smart white socks, a knitted dress and a big bow in her hair. She carries a soft toy. Has its tail come off? Or maybe that is something else altogether in Peggy’s left hand. Of course, Peggy was the Peggy Welch, the little daughter of Jack and Flossie. Jack had served his country (and had the war wounds to prove it) right through World War One. His parents kept the letters he sent home and Jack put together a scrapbook of photos and other items. In addition we also have his very brief hand written notes in the diaries he kept. It is our plan to release letters and diary entries on days 100 years after they were originally written in a separate blog (www.jackwelchdiaries.wordpress.com). The framework for this blog is in place and there may be a couple of scene setting posts, but it won’t really start until August. And we can thank Peggy again, for it was down to her to preserve her dad’s artefacts as well as all those other village items she amassed.